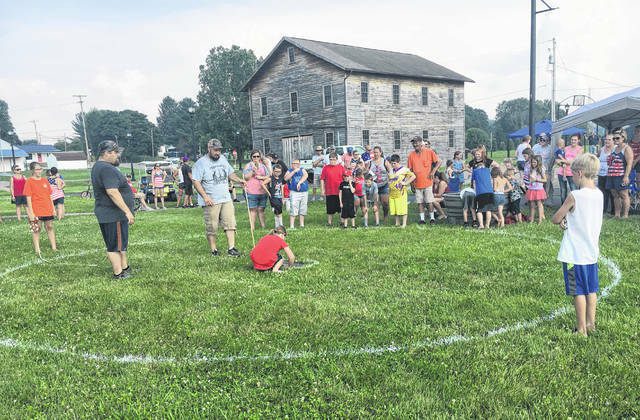 A crowd gathered at Star Mill Park on Wednesday afternoon for the frog jumping contest. 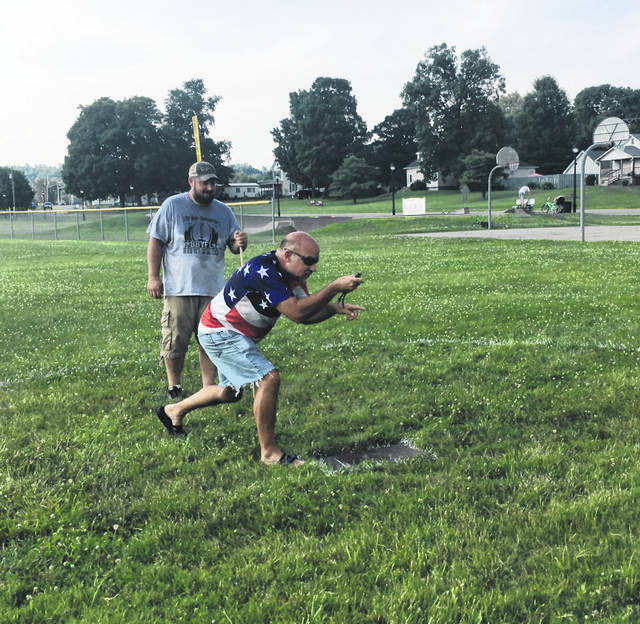 RACINE — The Frog Jumping Contest, which used to be a local favorite, returned to Racine’s annual July 4 event schedule at Star Mill Park on Wednesday. The event drew a crowd in the near 100-degree heat and had around 50 entries to see how far their chosen frogs could jump. Each participant had to coax their frog to jump and the measurement was taken from the starting point to the landing of the third jump. Some frogs needed some motivation to get moving. This took some yelling, clapping, stomping on the ground, and even blowing on the frog. The competition was taken very seriously. One bystander even described it like the Olympics. Ashli Peterman, who was the coordinator of the event, wanted to bring the Frog Jumping Contest back so her children could be a part of it. “There used to be stuff here (at the park) all day long,” said Peterman. This was an effort to keep people in town all day after the parade. Competition heated up with the adult age group and brought back many previous participants. Jerry Wolfe registered three frogs. He joked that each of them had a personality and champion breeding. He named each of his frogs, but one of them was named Fred’s Ghost. The name honors Fred Crow, who started the Frog Jumping Contest in Meigs County at the Big Bend Regatta. Although Wolfe said he has won the event twice, his favorite memory is helping his children participate in catching frogs and competing. The overall contest winner was Peyton Milliron with his frog named Rocket from the 12 and under age group. Rocket jumped a total of 15 feet, 2 ½ inches. The sponsors of the event’s prizes were Hill’s Sunoco, Maple Lawn Brewery, and West Main Car Wash & Service Center. Money raised through the event will be donated to the Racine Fire Department for the 2019 fireworks. 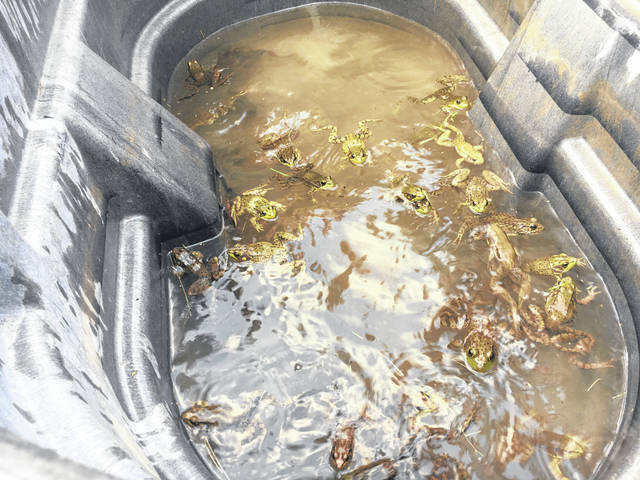 https://www.mydailysentinel.com/wp-content/uploads/sites/14/2018/07/web1_7.6-Frog-jumping-1.jpgA crowd gathered at Star Mill Park on Wednesday afternoon for the frog jumping contest.